Such is the molten hot fury of Syria’s now almost seven-year conflict, that it seems hard to think back to how things were before. Before the country imploded Syria was a relatively under covered location; the absence of actual conflict and its authoritarian control of media access meant that it lurked in the shadows while wars in its neighbors Lebanon and Iraq dominated the headlines. 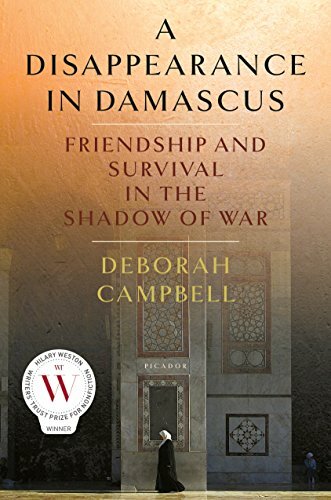 Syria’s relative safety, it’s incredible array of tourist sites, friendly people, and good food made it an excellent place to learn the language or in the case of Deborah Campbell, write more long form journalism based not just on interviews but on her own observational story telling. Campbell arrived in Syria not on a journalist visa in 2007 to meet some of the large number of Iraqi refugees who’d fled to the country. The fact that she is also a guest lecturer allowed her to take on a different identity, but as she spent more and more time in Syria she began to question the risks to herself and those around her of not revealing her true profession. A Disappearance in Damascus is a personal and unexceptional story in many ways, but in being told in that manner it reveals much about the character of the Syrian state than newspaper stories or even the books that have attempted to tell the story of the war. Campbell makes for an interesting guide to Syria—she describes herself as an “outsider” to her own culture, but is more obviously apart from those she meets in the Middle East. Against the backdrop of the story of the book—the life history and sudden disappearance of her Iraqi “fixer” Ahlam—her own relationship falls apart. The prose is simple and accessible, and the history and politics of the country told in broad brush strokes. The future uprising is signposted but not fully unpacked, the author explains its “true genesis was a class war: the city versus the countryside.” Yet the bigger picture of Middle East power politics is not what Campbell is trying to write about, instead in the vibrant, yet constrained, personality of Ahlam do we find the heart of the book. Ahlam’s childhood in rural Iraq, her energy and determination to do good in life is expertly told. The fallout from the American invasion is ultimately told in stories like hers. She supported and helped smooth their presence in her neighbourhood, but for that the price she paid was to be kidnapped and eventually forced to flee to Syria with her husband and children. In the outskirts of Damascus, she meets Campbell who chronicle her juggling of jobs while simultaneously setting up a school in her apartment block. The tragedy of having to flee her home and subsequently losing her 11-year-old son to a medical mistake, hangs over Ahlam yet never appears to hold her back. We check back and forth in on her life as we travel with Campbell in and out of the country but it’s clear we’re heading for the “disappearance” of the book’s title. This is when the real Syria reveals itself, not the place of friendly café owners but rather of leather jacket wearing security types. Following Ahlam’s arrest the book changes gear as Campbell questions her own potential role in triggering events and suddenly fears everything and everyone (turns out the Syrian authorities didn’t suspect her but rather wanted Ahlam to spy on the NPC journalist Deborah Amos). This is the strongest part of the book as it demonstrates the paranoia and fear that drives the pre-2011 Syrian state. Ahlam’s eventual release and acceptance to the United States is brief and feels like an epilogue that is almost not worth having. Instead the core of the book is a normal Syrian story of what it is to live in a police state, unexceptional but potentially terrifying.